Whether it’s for our jobs, or our own pleasure, we often find ourselves travelling around the world in one way or another. During travel, it is more likely than not that we are forced out of necessity to limit our lifestyles and become more minimalistic in nearly every aspect. The same can be said with tea. For those of us who enjoy fine teas, travel is daunting and can even be dreadful. The dust-filled tea bag strikes fear into our hearts and floods our palettes with bitterness. However, with just a little extra effort, (not to mention some wit) we can enjoy even the finest of our teas on the road. The first thing to consider when planning how to drink fine tea during travel, is how much room you will have to work with, and what resources you will have at your disposal. If you are restricted to only the tightest of spaces, you may be forced to bring only tea leaves while leaving any teaware at home. If this is the case, no need to worry, with a little bit of creativity, you can still enjoy the niceties of fine tea. If you are staying in a hotel room, use the room’s coffee pot to heat water into available paper cups. Place the desired amount of tea leaves into the cup and drink the tea “Grandpa Style.” While not the most luxurious method of brewing, all of the tea’s qualities will present themselves in the cup. If you are granted the luxury of more space to work with, you can consider bringing along a small teapot and cup, or an infuser mug. If this is the case, you will be able to enjoy tea just as you would in your very own home. The next item to consider is what tea you will be bringing along with you on your travels. Travel, especially business travel, can prove to be a great source of stress for many. For this reason, it can be a comfort to bring along a tea that provides a sense of home and familiarity. A favourite tea for example that you drink regularly can be a source of comfort between business meetings and appointments. For pleasure travelling and vacations, you may opt instead for something a bit more exotic and adventuresome. A tea such as our Organic Pink Grapefruit blend will allow you to branch out while refreshing your senses in a caffeine free way. Another item of consideration while selecting a tea to travel with is convenience. Because we are all too often limited in our resources during travel, convenience and ease of use is important. With this in mind, it is easy to see that loose leaf tea may not be the most ideal option for many travel scenarios. 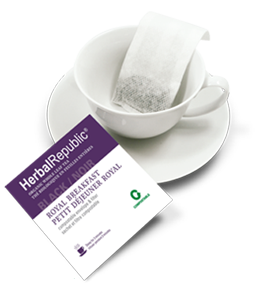 To offer the best tea at the highest possible levels of convenience, we at Herbal Republic have created our very own compostable and environmentally friendly tea bags filled with the highest quality whole leaf tea. Available in multiple varieties, our tea bags are sure to please even the pickiest of tea drinkers and provide an astounding level of choice while on the road. Simply throw the tea bag into a cup of hot water, brew for the desired amount of time and dispose of the tea bag. No mess, and no stress while brewing tea on your travels. Brewing a cup of good tea during travels not only makes your trip more enjoyable, but also adds a touch of the comfort of home when it may be needed most. With only a little extra effort and planning beforehand, brewing a cup of high quality tea on the road is a breeze. Let us know how you brew tea during your business trips or vacations! Send us your comments and travel tea experiences to chai@herbalrepublic.com.